Preheat the oven to 180°C (350°F/Gas 4). Rub the capsicums with the oil and arrange on a baking tray. Roast in the oven for 20–30 minutes, or until their skins blister. Place the capsicums in a plastic bag and seal; the steam helps to loosen the skins. Peel the capsicums, discard the seeds, and cut into 1 cm (½ in) slices. Set aside for later use. Meanwhile, place the chicken in a bowl with the garlic, lemon zest, harissa, smoked paprika and 3 tablespoons of olive oil. Season with the salt and pepper. Leave to marinate for at least 20 minutes. 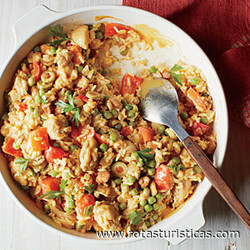 Heat a large paella pan or frying pan over medium heat. Add the chicken and cook for 6–8 minutes, stirring often, until golden brown. Remove from the pan and set aside. Return the pan to the heat, add a splash more oil if needed and cook the onion for 4–5 minutes. Add the saffron and cook for 1–2 minutes, or until fragrant. Add the rice and cook for 2–3 minutes, stirring often, until lightly toasted. Add the wine, stirring well, and cook until it has reduced slightly. Add the stock and bring to the boil. Reduce the heat to a simmer and cook for 15–20 minutes, stirring often, until almost all the stock has been absorbed by the rice. Add the peas and reserved capsicum strips and cook for another 3–4 minutes. Stir well for the last 2–3 minutes, ensuring the peas cook through and the remaining stock is absorbed. Add more stock or water if necessary. Taste for seasoning, then stir in the parsley and lemon-infused olive oil and serve.